talkhealth > Blog > 2015/09 > The stigma of stomas? Luke Bennet’s very brave ‘selfie’ that went viral with 3 million views and shared by 10 000 users, depicted the 20 year old law student from Swansea standing in his boxers with his 5 week old stoma bag proudly on show. He had a condition called inflammatory bowel disease and in particular ulcerative colitis, which causes profuse blood stained diarrhoea with sufferers having to open their bowels up to 20 times a day. In severe forms and when the whole of the large bowel is affected, the condition may be life threatening, particularly if emergency surgery has to be performed to remove the colon. In Luke’s case, conventional medical therapy with steroids and immunosuppressing drugs, had failed to control his symptoms and he made the decision to have ‘cold’ elective surgery to remove a large proportion of his large bowel (sub-total colectomy) and have a ‘bag’. 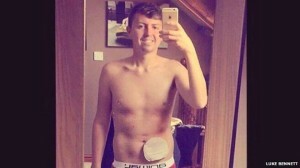 The charity ‘Crohn’s and colitis UK’ (www.crohnsandcolitis.org.uk) stated that Luke’s decision to make the posting was ‘brave and inspirational’ and pointed out that 10 000 young people get diagnosed with inflammatory bowel disease each year. Not all stomas have to be permanent and it is quite possible that other surgery could be performed in Luke to regain the continuity of his bowel, however a lot of patients with stomas prefer the bags so much more than the inconvenience of having to return to rushing off to the loo, that they opt to keep them! For more information on anything in this article, please click here. Dr Helen Webberley is an NHS GP with a practice in South Wales, and an experienced online doctor providing healthcare advice and treatment via the Internet. She is a talkhealth expert in the Online Clinics. If anyone has any queries about their health then feel free to contact her.